Title : La Donna delinquente (1893; English trans. 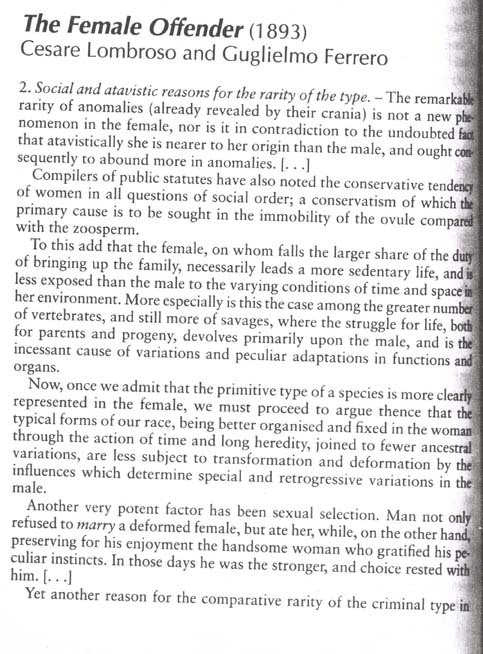 , The Female Offender, 1895) in L. Bland and L. Doan (eds. ), Sexology Uncensored: the documents of sexual science (1998). Keywords: Lombroso. Ferrero. Atavism. Women. Craniometry. Inheritance. Physiognomy. Born Criminal. Prostitution. Civilisation. Cannibalism. In The Female Offender, excerpted in L. Bland and L. Doan (eds. ), Sexology Uncensored: the documents of sexual science (London, 1998), pp. 20-21, Lombroso and Ferrero attempted to account for what they perceived to be the comparatively limited physiological differences between criminal and normal women. They argued that women in general were less advanced in an evolutionary sense than men, and so atavistic females had a smaller biological distance to travel than did atavistic males: female criminals were much closer to the female norm than male criminals were to the male norm. This easily led to the assumption that all women were atavistic to some extent and had a criminal taint.